I have heard people describe Little Switzerland as a state of mind. Most who come to believe this fight to spend leisure time or live in this special place at least part of every year. There are also folks who come to Little Switzerland but don’t find it. It’s not always clear what they expected to find, and possible that whatever it is might never be found. The roads, admittedly, are confusing to the uninitiated. The correct paths from the Parkway to Downtown Little Switzerland or back again could justifiably be called bizarre. Didn’t they think they would find spectacular mountain scenery? Beautiful lodges and quaint, curious cabins and houses nestled hidden in hollows and on ridges? People with time to say hello… Giant butterflies flying allegro up and down hillsides? Squadrons of humming birds executing back porch feeder raids? Wild orchids, blueberries, blackberries, bears, trout, to say nothing of the spectacular feasts of rhododendron and azaleas in season? Visitors who don’t”see” Little Switzerland should keep on searching for their Shangri-la. Perhaps if lucky, they might find themselves back on this mountaintop another day when the fog has lifted. Things could look different next time around. The first question we usually hear is,”Pardon me, ‘Where is Little Switzerland? '” We are asked this question so often that it has become an ongoing source of amusement. “That’s why we call it Little Switzerland! Ours is a mountaintop settlement, older than the Blue Ridge Parkway by some 30 years. There is the old road (NC 226A) which meanders up the mountain along Armstrong Creek, and the new road (NC 226), which climbs up beside Coxes’ Creek. These roads separate at the bottom of the mountain and then, some 12 miles up, they come together again, at the Little Switzerland Post Office. The Switzerland Store (circa 1926) is right across the road from the Little Switzerland Post Office. Several years back, Harold McKinney was spending a lot of time sitting on the waitin’ bench outside The Switzerland Store. 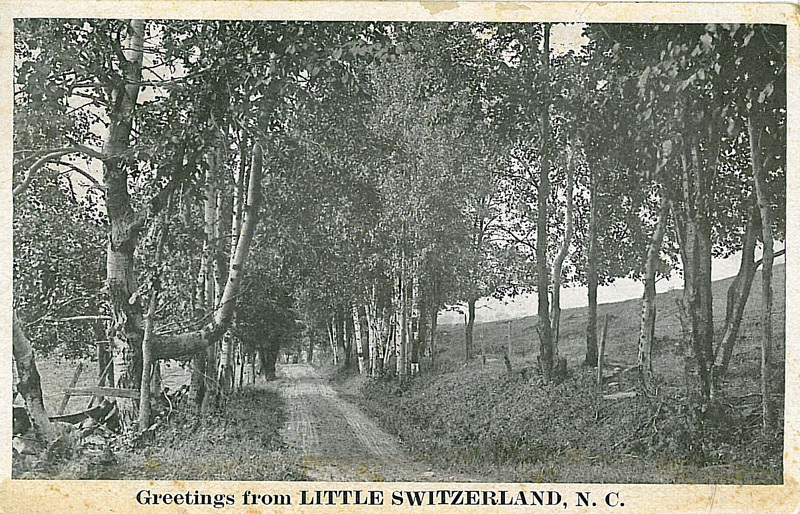 When cars stopped and tourists asked him,”Where is Little Switzerland?” he would direct them to proceed down the mountain the way they were headed on 226A until they reached the bottom, then turn left on the first paved road they came to, which would be NC 226. They could follow the signs up to Little Switzerland.